Tonight, Walthamstow’s Deceased17 Gallery opens its second exhibition at 148 Hoe Street. Curated by tQ’s visual art editor Robert Barry and supported by The Quietus and Zero Wave, Deceased17 is a window gallery in the storefront of a former funeral parlour at 148 Hoe Street. Following last month’s show of abstract expressionist paintings by Emily Mary Barnett, the gallery returns with an exhibition of four sculptures by Daniel Davidsson, an artist with an interest in Russian Constructivism, Brutalist Architecture, and the Basque Gaur group. 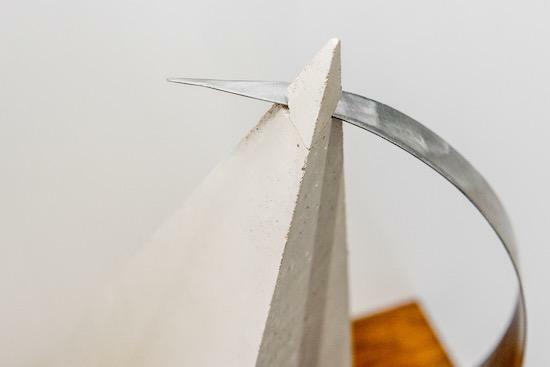 The four works gathered together for Sentinels, Davidsson’s second show in a UK gallery, were all created during a series of residencies at the London Sculpture Workshop in Woolwich, and Blackhorse Workshop, Walthamstow. The concrete in Integration, Homage To Constructivism, and Pillars In Space was cast in moulds made from sheet metal. The distinctive speckled patina on the last of these three a result of the concrete being cast with the steel inserts placed in situ. As the concrete poured through the steel it picked up traces of rust which then found their way to the surface through the flow of the concrete, creating a unique starburst effect. The aluminium in Teardrop was cast using a traditional method called sand casting, using a mould which in this case was made from a two-part epoxy resin. It is then placed in a specific sand that is fine enough to take an impression and strong enough to hold the impression when you remove your mould. Molten aluminium is then cast into the sand and funnels it’s way down to the void in the sand. Once cooled the aluminium was refined using an orbital sander and finished with specific metal polishing compounds. Daniel Davidsson (born 22 July, 1982) is a London-based abstract sculptor. He was born in Reykjavik to Icelandic and English parents, grew up in Brighton, and now resides in Camden Town. Having trained initially in science and engineering, Davidsson began practicing sculpture in 2013. Sentinels will run at Deceased17 Gallery 148 Hoe Street Walthamstow, from 1 June to 29 June. A small private view will be held on the street outside the gallery this evening (Thursday 1 June) from 7pm. All welcome.